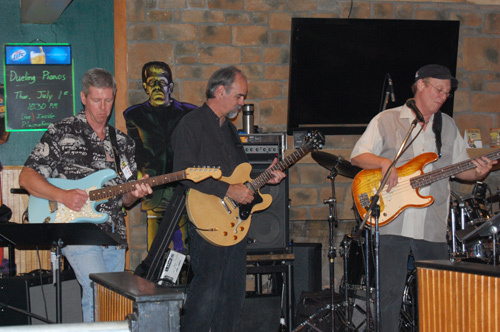 Mark Statler's Creepy Classics Chiller Band with guest guitarist Kevin Slick and Frankenstein looking on during the 1950s Sock Hop at Monster Bash! 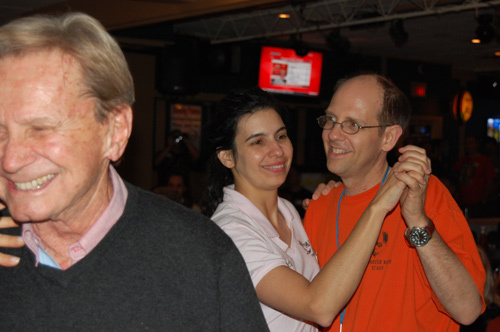 Having a BASH at the Monster Bash Sock Hop - actor Kenny Miller from ATTACK OF THE PUPPET PEOPLE, Ursula and Ron Adams. 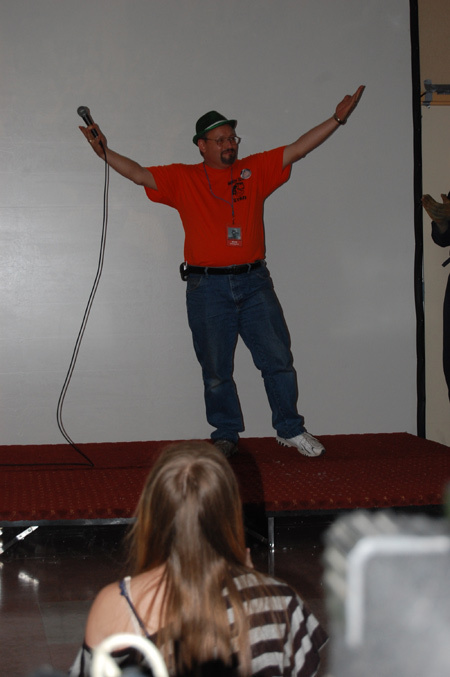 Movie Maker Bert I. Gordon kicks up his heels for the 1950s sock hop! 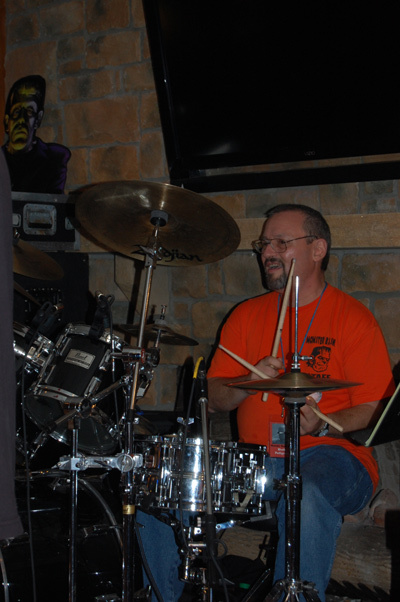 Monster Bash's Bob Pellegrino pounds the skins as he sits in for the final song at the sock hop - "Monster Bash!" by Mark Statler. 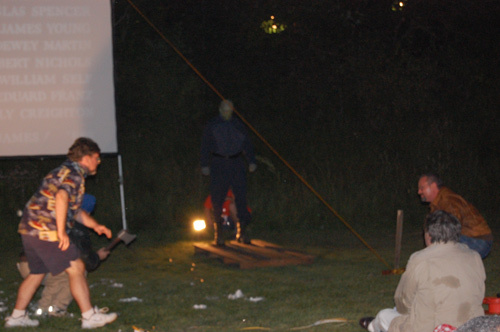 The end of "The Thing" is re-enacted live at Monster Bash! Dan Weber stood about 6'8" in The Thing costume and make-up. 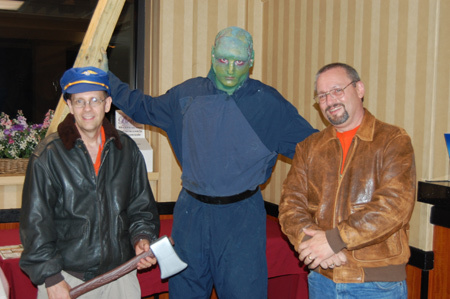 Shawn Isreal played the doctor with Ron Adams (with axe behind Shawn) was the Captain and Bob Pellegrino tossed a 4X4 at The Thing...who proceded to chase them with it instead of being electrified! 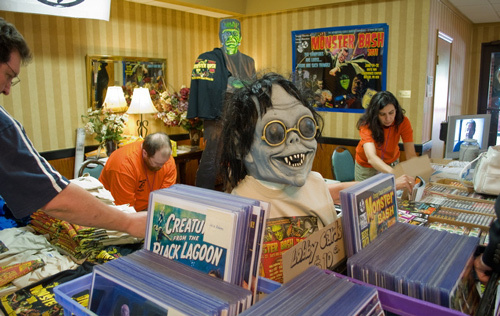 Festival of the New Wine - it's the song from FRANKENSTEIN MEETS THE WOLF MAN sung by Bob Pellegrino right before we threw free monster toys, DVDs, books, monster beach balls and more to the audience! 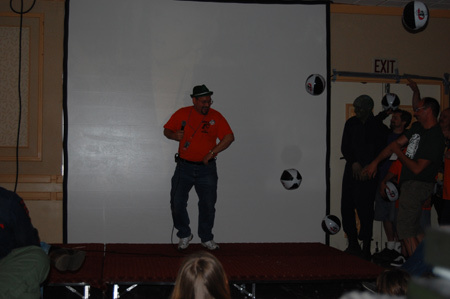 Bob is pelted by beach balls at the end of the song! 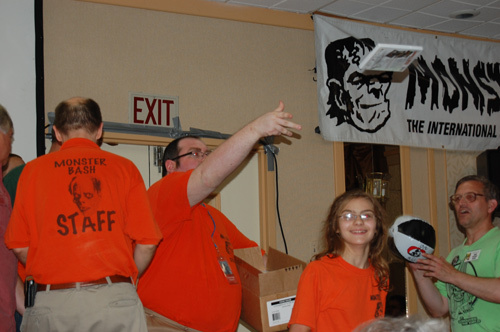 Prize Toss - free goodies for folks in the audience. 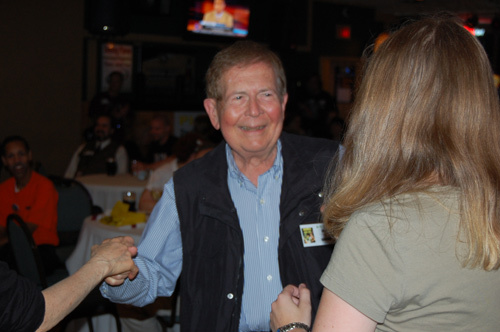 Monser Bash staffer Leonard Hayhurst flings someone a free DVD. David "The Rock" Nelson gives the "thumbs-up" on the giveaways. 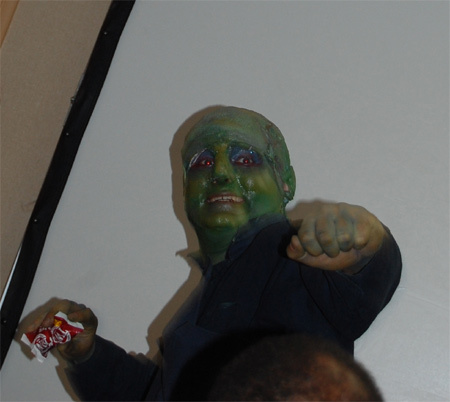 Something is very frightening about a hell-spawned alien tossing candy to attendees. 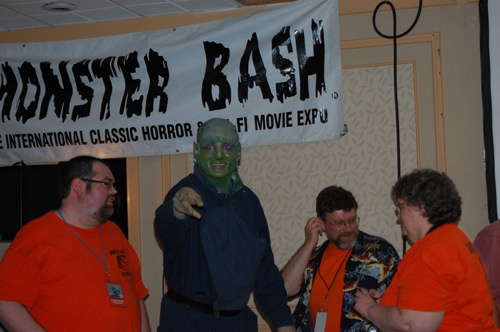 At Monster Bash Registration it's Leonard Hayhurst, Scary Monsters' Sam Scare in person, and Ursula Adams. 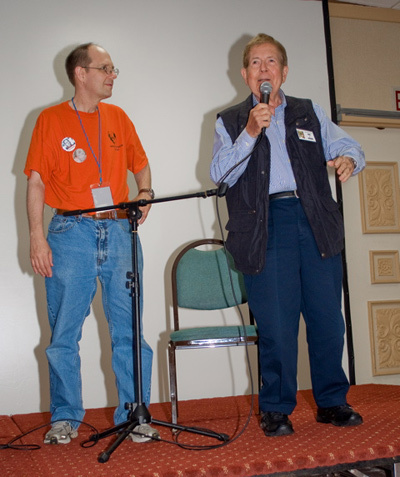 Ron Adams, master of scaramonies, and Bert I. Gordon. 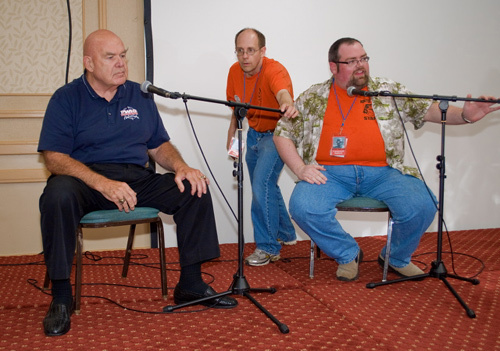 Ron adjust the microphone for George "The Animal" Steele as Leonard Hayhurst fields questions from the group. 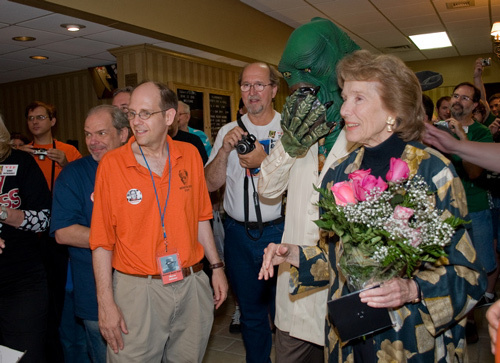 Julie Adams with Gill-Buddy look on as the Three Stooges cut five giant sheet cakes! Everyone is pretty stunned!